Fiat 500s are so last year! their are certain cars that are just girly, the original for me was the Ford KA, then there was the Nissan Micra, and then there was the Fiat 500, which, despite my opening comment I still love. Recently I have been totally falling in love with a another girly car, one of my girlfriends swears by her second hand Renault ZOE, and I agree to an extent, but this one is a bit more feisty, packing a bit more of a punch and aggression. The main thing that really makes me want this car is the incredibly lush colour options you have. one word…. PINK! That’s right ladies you can get the DS3 customized in pink paint! I know right!? OMG! There are two different styles, you can go pink and black or pink and white. The roof and the wing mirrors are the parts that get covered in pink. Aren’t they just darling? What’s more, the pink Citroen DS3 looks absolutely stunning on the inside too! There a splashes of pink everywhere, the whole dashboard is pick and the gear stick is pink and proud! There is also a special edition version I have noticed where the interior is divine. 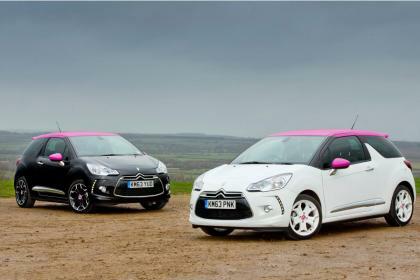 For some terrible reason Citroen are no longer doing the pink edition there are a fair few pink second hand Citroen DS3 models online for around 10 grand, and that includes both the black and white variations. Unfortunately I am yet to find one for sale with the “hello gorgeous” interior but hopefully one day I’ll find it! April 30th, 2015 | Uncategorized | Comments Off on OMG Pink Citroen DS3… PINK!